Obituary for Effie Diamond | Kostanski Funeral Home, Inc.
Greenfield- Effie (Lolos) Diamond, 102, died Thursday 10/18/18 at the Buckley Health Care Center in Greenfield. She was born in Springfield, MA on June 11, 1916, the daughter of Peter N. and Helen (Delivorias) Lolos. Effie attended local schools in Springfield and was a graduate of the High School of Commerce in Springfield. Effie has been a resident of Greenfield since 1946. 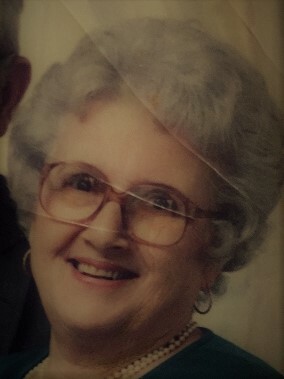 She was a sales clerk at the Forbes Camera Shop in Greenfield for many years before her retirement in 1990. Prior to that, Effie worked at Belle’s House of Beauty in Greenfield. She was an avid bowler and enjoyed knitting and crossword puzzles. Effie was a member of the Holy Trinity Greek Orthodox Church in Holyoke and of the Women’s Association. She enjoyed volunteering at the Franklin Medical Center in the Gift Shop. Among her survivors, Effie leaves a son, Peter and his wife Terry of Port Jervis, NY; two daughters, Mary Rist of Coco Beach, FL and Elaine Anderson and her husband Ross of Greenfield; eight grandchildren; eleven great grandchildren; two great great grandchildren; and several nieces and nephews. Effie was predeceased by her husband, Nicholas S. Diamond on November 3, 1991 and by her siblings, Nicholas Lolos, Kanella Fotopulos and Ella Nastopoulos. Funeral services will be held Monday 10/22 at 11am at The Episcopal Church of Saints James and Andrew, 8 Church Street, Greenfield with the Rev. Thomas Cokotis, pastor from the Holy Trinity Greek Orthodox Church in Holyoke, officiating. Burial will follow at Green River Cemetery in Greenfield. A calling hour will be held Monday morning from 10am until 11am at The Episcopal Church of Saints James and Andrew. Memorial contributions may be made to the Holy Trinity Greek Orthodox Church, 410 Main Street, Holyoke, MA 01040. Arrangements are under the direction of the Kostanski Funeral Home. For condolences, please visit www.kostanskifuneralhome.com.